approx. 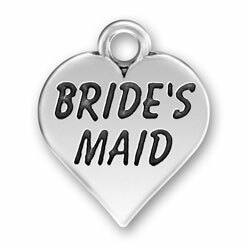 11/16" x 9/16" 2 charms - Bridesmaid is approx. 13/16" x 7/16" and the flower bouquet charm is approx. 3/4" x 1/2"
approx. 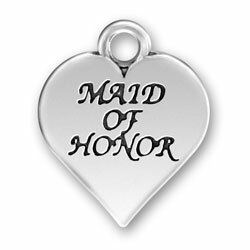 13/16" round textured disc, says "To My Maid of Honor Heart - approx. 5/8" x 9/16"
Heart, approx. 9/16" x 1/2" 3-D, approx. 3/4" x 3/8"
Textured and antiqued, approx. 3/4" x 5/8" 2 charms - Flower Girl charm is approx. 7/8" x 1/2" and the tussie mussie flower bouquet charm is approx. 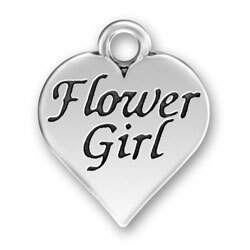 3/4" x 7/16"
Larger version of Flowergirl D charm, textured and antiqued, solid back, approx. 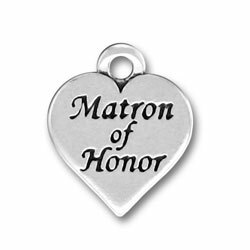 15/16" x 7/8" - a nice size for a necklace Artist-designed, handcrafted in the USA charm, approx. 7/8" x 1/2"
Artist designed and hand crafted charm, approx. 13/16" x 7/16"